Wen-mei W. Hwu is a Professor and holds the Sanders-AMD Endowed Chair in the Department of Electrical and Computer Engineering, University of Illinois at Urbana-Champaign. His research interests are in the area of architecture, implementation, compilation, and algorithms for parallel computing. He is the chief scientist of Parallel Computing Institute and director of the IMPACT research group (www.impact.crhc.illinois.edu). He is a co-founder and CTO of MulticoreWare. 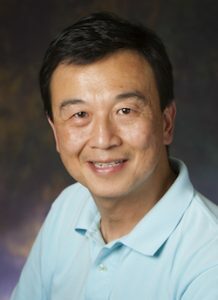 For his contributions in research and teaching, he received the ACM SigArch Maurice Wilkes Award, the ACM Grace Murray Hopper Award, the Tau Beta Pi Daniel C. Drucker Eminent Faculty Award, the ISCA Influential Paper Award, and the Distinguished Alumni Award in Computer Science of the University of California, Berkeley. He is a fellow of IEEE and ACM. He directs the UIUC CUDA Center of Excellence and serves as one of the principal investigators of the $208M NSF Blue Waters Petascale computer project. Dr. Hwu received his Ph.D. degree in Computer Science from the University of California, Berkeley. The IMPACT group at the University of Illinois has been working on the co-design of scalable algorithms and programming tools for massively threaded computing. A major challenge that we are addressing is to simultaneously achieve scalability, performance, numerical stability, portability, and development cost. In this talk, I will go over the major building blocks involved: memory layout and dynamic tiling. I will show experimental results to demonstrate how these building blocks jointly enable the first scalable, numerically stable tri-diagonal solver that matches the numerical stability of the Intel Math Kernel Library (MKL) and surpass the performance of CUSPARSE. I will then give an overview of the Tangram and Triolet projects that are aimed to drastically improve the quality and reduce the development and maintenance cost future many-core algorithms.